When you have eight miles of harbor to maintain, there’s always something to do. 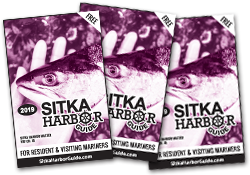 The next major project for the Sitka harbor system will be the complete rebuilding of the Sitka Transient Float, a little to the north of the harbormaster’s office. The transient float makes a small V with Petro Marine’s new fuel dock. The rebuilding is pegged at about $6 million and is scheduled to begin in the fall of 2015. The 40-year old transient float was originally built as a wave container to protect old Thomsen Harbor, and was laid out in an L-shaped configuration. After the rock breakwater was built, the float was straightened out to be used for moorage. Harbormaster Stan Eliason said an inspection of the dock prior to the 2011 herring fishery revealed that the infrastructure was failing. The dock required an emergency repair just before the fleet got here. 2014 welcomes a completely refurbished ANB Harbor. Sitka Harbormaster Stan Eliason said everything was replaced – floats and fingers, electrical and water hookups, even the main pilings. The approx. $7.5 million project was funded through a 50/50 match with the state. ANB’s new configuration accommodates 94 vessels of various sizes, a few less than the old setup. Once a week in winter and twice a week in summer, Castle delivers to these outposts food and all manner of supplies. What makes him infrastructure is that he also carries the U.S. mail. In 1862, five years before the U.S. took possession of Sitka and Alaska, the government started printing the beautiful, color lithographic charts on heavy bond beige paper that were ultimately sold by private vendors, like Murray Pacific and Old Harbor Books. That era has come to an end. Last year, the Federal Aviation Administration, which distributes both aeronautical and nautical navigation charts, announced that after April, 2014, they will no longer distribute the printed nautical charts (aeronautical charts will still be produced.) FAA took over chart distribution from the National Oceanic and Atmospheric Administration in 1999. Fishermen are a famously independent lot who sometimes get accused of letting their independence get in the way of their own long-term economic interests. Well, the more than 500 fishermen-owners of Seafood Producers Cooperative (S.P.C.) can tell their accusers a story that shoots that reputation down. It’s a story that goes all the way back to the 1940’s, picks up in Sitka in the 1980’s and continues big time today. The fishermen-owners of S.P.C. produce eight million lbs. of catch annually, netting $44 million in gross sales revenues. With buying stations up and down the West Coast, S.P.C today is the oldest, largest and most successful fishermen’s cooperative in North America. ANB Harbor, first built in 1956 and last renovated in the 1980’s, is the oldest of the city’s five harbors. By 2014, it’s going to be the newest. A complete replacement of the entire float system and pilings at ANB Harbor is scheduled for this year. “The problem is flotation,” Eliason said. “We had a meeting down there (at ANB Harbor). There were four of us on the float and we had to disperse our weight to keep from sinking.” He said ANB Harbor has been costing a lot of money and staff time to stay ahead of the spreading deterioration. Affordably-priced 2-way texting is now available outside of the cellular area. The DeLorme InReach device (and free app) transforms your smartphone or tablet into a two-way text message global communications device and a GPS viewer. The InReach device also offers a number of safety and navigational features. It costs about $250. newitem1InReach allows you to compose and send text messages of up to 160 characters. 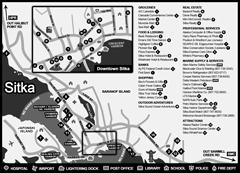 You can even post to Facebook, Twitter or your own shared map. An interactive SOS feature allows mariners to describe their situation in detail to rescuers and stay in touch. “Local surf & turf,” is how my sweetheart and I dubbed our 2012 Valentine’s Day locally-harvested dinner of stewed venison and pan-fried coho. The melt-in-your mouth venison chunks and flakes of salmon were perfect, but, being a culinary barbarian and old-school, I reached for the salt. And then I remembered that I had been given a sample of fancy finishing salt, made from the salt water right off our shore and produced in a building off Sawmill Creek Road. You can’t get more local than that! Do you consider a laptop computer an essential piece of fishing gear? If you answered “no” you may be a member of an endangered species. Mariners are finding laptop computers are increasingly valuable at sea as more and more useful hardware and software hits the market. One nifty combination of hardware and software starts with the easy installation of a GlobalSat USB GPS Navigation Receiver ($59.95 retail). As its name implies, you just plug in the USB cable into your laptop. The software comes by accessing an Open Source, free website to access navigational charts – www.opencpn.org.